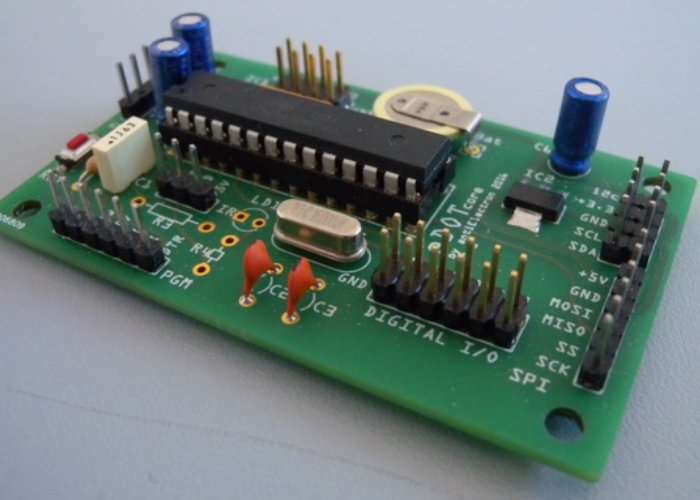 Electronics enthusiasts that enjoy using the Arduino platform may be interested in a new enhanced Arduino Uno development board which is being created by antiElectron based in Milan Italy. The eDOTcore development Board is based on the Arduino Uno but has been specifically designed to provide a more versatile base with built-in precision real-time clock (RTC). Watch the promotional video below to learn more about its features and design. eDOTcore is available to back with pledges starting from just €14 for the eDOTcore PCB without components. eDOT core is a versatile Arduino board with built-in precision RTC. It has been originally designed to be employed with eDOT clock and the board fits perfectly inside the eDOT enclosure, but it is also suitable for custom made portable project (solar, etc.) where a very low power consumption is preferable. It features a very essential component layout that makes the board very compact. The board does not fit USB to TTL converter but just the interface connector; an external USB to TTL converter will be required to upload the Arduino sketches. In case of very low power application the power LED can be disconnected so that the total current will be less that 500 microamperes at 5V. The board can be supplied up to 12VDC and has two on-board low drop regulators that provides 5VDC (SPI) and 3.3VDC (I2C) for optional external board’s supply. The regulators may be easily replaced to fit custom supply voltages for both the ATMEGA and the external sensors. The double layer PCB is professionally manufactured with metallized and gold plated holes, green matte paint and silkscreen.